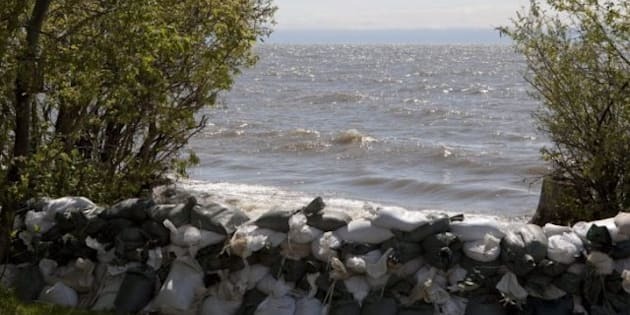 WINNIPEG - Manitoba is constructing a $100-million emergency channel to drain water from Lake Manitoba by the fall, Premier Greg Selinger said Tuesday. Two engineering firms recommended the eight-kilometre-long channel to divert flood water from the lake through Lake St. Martin and into Lake Winnipeg. Once that project is complete, the province will look at building a second waterway to further ease pressure on the lake at a cost of $60 million, Selinger said. The two channels together would bring the lake down almost a metre, Selinger said. Manitoba wants Ottawa to cover 90 per cent of the cost under disaster assistance. The province hasn't received assurances from the federal government that it will pick up the tab, but Selinger said doing nothing is not an option. "If no action is taken now, hundreds of properties around both lakes will be threatened by flood waters for an extended period," he said. "This would extend evacuations and leave homes, cottages and businesses vulnerable well into next year and possibly beyond. "It's a risk we do not think we should take, we are not willing to take." For weeks this spring and into the summer, the province struggled to contain the swollen Assiniboine River by operating the Portage Diversion -- a channel that funnels water from the river into Lake Manitoba -- well over its design capacity. That pushed water levels up on Lake Manitoba, which cut off roads and caused considerable damage when spring storms whipped up waves that slammed into homes and cottages. Some 2,000 people have been forced from their homes on the shores of Lake St. Martin and Lake Manitoba. About 600 residents from the Lake St. Martin First Nation have been away since May and could see their reserve moved permanently to higher ground. Calling this a one-in-2,000-year event on Lake Manitoba, the engineers said those people could be out of their homes for another year unless the province takes action now. "This is the longest flood we've ever seen in our lifetime," Selinger said. "After you've had an event like this, the occurrence of another high-water event is statistically significant. In other words, it could happen again." The premier said he would feel more confident going into flood season next spring if some water can be drained from Lake Manitoba before it freezes. But some residents don't share that optimism. Kevin Yuill, a farmer around Lake Manitoba, said the lake is almost two metres higher than normal. The channel is a good start but it won't be enough to protect homes and livelihoods, he said. Winds shift in the fall, he explained, and come in from the north. That would mean even more devastation on the southern lake's shore. "This has been absolute hell," he said. "But we haven't seen the worst of it yet. That is the scary thing for us." The province is hoping to have the channel almost completed by November and will continue to drain water throughout the winter through the Fairford Dam. Carving out the channel from bog that is covered in water, in a remote northern location, will be no easy feat. Engineers estimate it will take 50 pieces of heavy equipment and 150 construction staff to finish the waterway quickly. Helicopter pads and barges will also be necessary. "This is a huge challenge," said Emergency Measures Minister Steve Ashton. "The No. 1 element is to move as quickly as possible. We're going to go 24/7 right from Day 1."